Think of the front of your house. Now – picture it at night. Can you easily see your house, or is it too dark to make out? Guests (or prospective buyers) can arrive after the sun goes down. Even though it may be dark, your home should still shine. 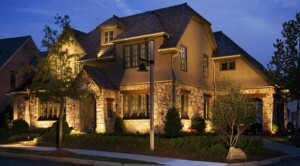 A well-illuminated home provides not only curb appeal but also enhanced safety and security. Properly designed outdoor lighting will accent the architectural detail and landscaping features of your home. To start, create a focal point with your entryway. For a symmetrical entrance, place a light fixture on either side of the door. The fixtures should be properly proportioned so that they are in scale with the rest of the house. Lights that are too large can overwhelm a smaller home, while cute but small light fixtures may seem puny on a larger one. If the entryway is covered, an overhead light or pendant may be used instead of or in combination with wall fixtures. Some entryways lend themselves to having a fixture on just one side of the door. If possible, it should be on the same side as the doorknob. Once your focal point is in place, consider adding uplighting as an unexpected way to add drama in other areas. Uplights can be used along the walls of the house to highlight architectural features and also used to highlight trees or other landscaping elements. Another way to give a sense of presence to trees is to mount lights in the branches. Other lights can give presence and be practical as well. Combine lights with plants along walkways to provide safety lighting that looks elegant. Step lights and post lights can have the same effect on stairways, adding a warm glow while ensuring the steps are easily visible. Use bulbs that emit warm white light to make your home inviting. Lights that are too stark or blue will seem cold and harsh. Make the lighting soft and consistent, eliminating any dark areas that might provide cover to an intruder. Having lights that are too bright may actually be detrimental by creating bright spots here and there while leaving unlit areas in the dark. Finally, take advantage of technology. Lights that provide ambient rather than security lighting can be placed on timers so that they will automatically cut off at a certain time. Use light sensors for lights that you want to come on each day whenever it gets dark. Motion detectors can be used to provide additional lighting only when needed as well as enhancing security by calling attention to the motion. Curb appeal is important, no matter the time of day. Use lighting to make your home just as warm and inviting at night as it is during the day.